SAN DIEGO, California, PARIS, France and MONTEVIDEO, Uruguay (September 18, 2013): Eurus Energy America Corporation (“EURUS”) and Akuo Energy SAS (“AKUO”) are pleased to announce that Eurus has acquired a 43.5% ownership interest in the Minas Wind Farm Project, a 42 MW wind farm located in Lavalleja, Uruguay being developed by Akuo through its subsidiary Generacion Eolica Minas S.A., (“GEMSA”). 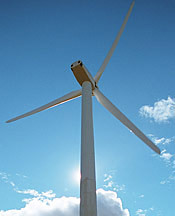 Construction on the Minas Wind Farm began in March of this year. The project is comprised of 14 Vestas V112 3.0 MW wind turbines and will sell all of its output to Administracion Nacional de Usinas y Trasmisiones Electricas (“UTE”) under a 20 year power purchase agreement. When completed in early 2014, the Project will help UTE meet the country’s target of producing 25% of its electricity needs from clean, renewable sources located in Uruguay. In June, GEMSA closed its non-recourse project financing, obtaining a USD 79.5 MM construction and term loan facility from KfW IPEX-Bank. Danish export credit insurer Eksport Kredit Fonden (EKF) provides a guarantee for 80% of the loan, and KfW IPEX-Bank also provides VAT and LC facilities as part of the financing. The Minas Wind Farm is Akuo’s second to enter the construction phase in Uruguay after the 50 MW Florida Project began construction in January of this year. Eric Scotto, President of Akuo Energy states ”We are delighted to welcome Eurus as a strategic partner alongside us in the Minas Wind Farm project. This partnership reinforces our expansion strategy which consists in consolidated green electricity sales while partnering with sound institutional actors sharing our values. Eurus’ experience in the wind sector is invaluable for projects of this size; this will mark an important step in Akuo’s long history in Uruguay and will contribute to our continuous worldwide growth in the renewable energy sector”. Akuo Energy (www.akuoenergy.com) is a French independent renewable energy power producer that is present across the value chain, including project development, financing, construction, and operation. As of December 31, 2012, Akuo Energy had financed 409 MW of assets now in operation or construction. The Group has more than 130 employees worldwide and operates in 13 geographic zones, including France, Reunion Island, Corsica, The Antilles, Poland, Croatia, Serbia, Montenegro, Morocco, the United States, Uruguay, Indonesia, and Turkey. Akuo Energy generated 72 million euros in sales in 2012, and it aims to have a global production capacity of 3,000 MW by 2018.